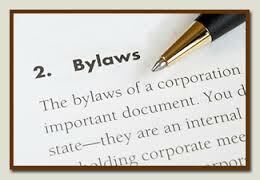 Bylaws are the rules and guidelines for a corporation, and resolutions are supplemental documents to the bylaws. The rules and regulations of a corporation are determined in their bylaws. The bylaws also define the structure of the business, the purpose, how the corporation will run its affairs, and the duties and responsibilities of those involved. Resolutions can be used for many things, and are often required for certain tasks or decisions by the bylaws. For example, a resolution might be used by the corporation to decide they are opening a bank account, authorizing spending, or authorizing the reimbursement of purchases. Maintaining bylaws, using resolutions when required, and having annual shareholder and director meetings are important steps to keep your corporation in compliance.